I have been inching down the vegan/vegetarian path for some time now. Being a Buddhist practitioner, one of the Buddhist aspirations (not a commandment) is to eat vegetarian or vegan to minimize the suffering of sentient beings. Furthermore, more and more friends and colleagues have taken this step, including my best friend who made that big decision last week. With all these signs around me, I couldn’t help but start focusing on more eating establishments that cater to such meatless cuisine. 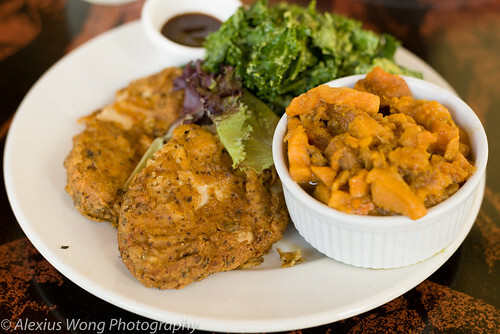 Recently, an online coupon offer showed up on my computer, and I quickly grabbed that opportunity so that I could visit a vegan Soul food restaurant. 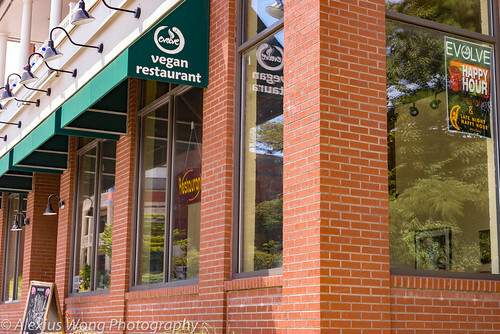 Evolve Vegan Restaurant is located in the heart of Takoma Park, NW Washington, merely a few steps from the metro station. It is located in a block of eating establishments that has garnered the recognition as the best vegan eating area in the city. Walking into Evolve, the space appears more spacious than its true real estate due to the storefront windows and the soaring ceiling that add lots of light and an airy feeling. 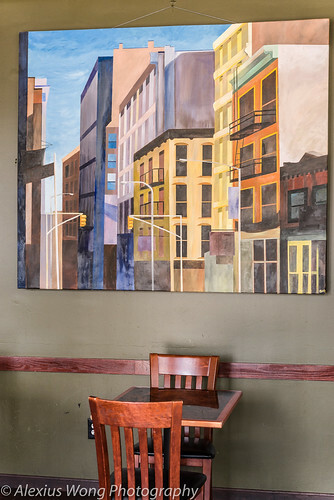 Taking a seat by the window, I perused the one page menu, and it is rather short with only a handful of entrees, a similar amount of sandwiches and salads, followed by an interesting plethora of side dishes. The drinks section was filled with sodas and smoothies, which were not exactly what I was looking for as a thirst quencher. The waiter relayed to me that the restaurant was working on the drinks section which seriously needs more light or fruit-infused liquids. Not letting that be a hindrance, I moved on to the main courses. Online reviewers made mention of the house’s Southern Fried Chick-un, and that was the first order placed on the initial visit. 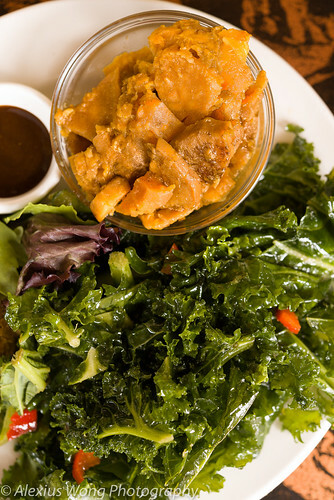 The dishes picked from the list of fourteen sides were Yams and Sweet Maple Kale Salad. The plate arrived with two fairly large patties encrusted with the traditional-looking batter associated with the real thing. One bite into them was completely revelatory. 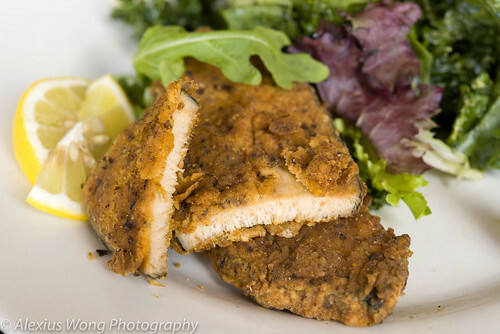 The texture was akin to that of chicken breast and the flavor replete with the fried chicken seasonings. The first time ordering this was a version with a formidable crust but a slightly dry “meat”, whereas the second had a crumbly crust but a moist inside. Nevertheless, the patties fooled my taste buds with the close texture and unmistakable flavors in the seasoning. The side BBQ sauce was a proper one with its smoky sweet and sour qualities that gave the diner that dipping option. In addition to the tasty patties, the sides were wrestling my attention away from the protein. The Yams were the candied yams that one would find during a Thanksgiving meal, made with a good hit of cinnamon without overpowering the tubers and sweetened by brown sugar, all tasting good enough to slap your….. But the star for me was the kale salad with the young tender leaves made delectable by a well-balanced combination of maple syrup and toasted sesame oil, making each leaf totally irresistible. Now I can see why the online folks highly recommended this entrée, and deservedly so. Wrapped Soyfish was the next main dish. The slices of soy protein arrived battered and perfectly fried, just like the above dish, along with Ratatouille and Ginger Kale Salad as the sides. The “fish” also took me by surprise by the rather firm texture, reminding me of tuna or swordfish steaks. Additionally, the flavors were enhanced by the seaweed wrap that exuded seafood umami-ness, boosted by a hint of Old Bay seasoning in the batter – my dining companion and I were quite satisfied by these “seafood” bites. The sides were equally delectable. The Ratatouille was a melange of zucchini, yellow squash, onions, tomato, and eggplant, all looking and tasting more like stewed yellow squash served in the South due to the lack of enough tomato found in the veritable version. Notwithstanding, this mix was so savory and well cooked with each element holding its own identity and enhanced by a faint hint of dried herbs, perhaps thyme or oregano. 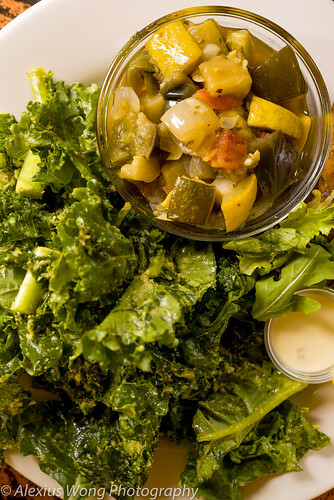 The other companion of kale salad literally grabbed my taste buds. The mild leaves were coated by a powerful ginger pesto that had a good bite that made each leaf quite piquant, but balanced by a hint of vinegar and sugar. Needless to say, not a single leaf was left on my plate as this dish combination was also a hit for me. 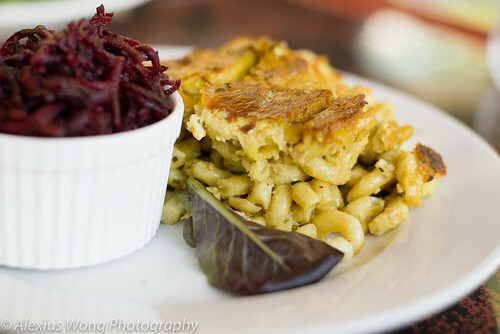 On the second visit, I had to try another oft-mentioned main – Macaroni and Cheese. The main dish arrived with Beet Salad and Sesame Spinach Salad as their chosen accompaniments. The pasta casserole mix was rather interesting yet tasty at the same time. The macaroni was cooked just right, not al dente, neither too mushy. The mix was quite “creamy” rich yet rather moist, with a crust of gratineed vegan cheese . However, there was slight off note of faint bitterness not usually associated with this dish, but that didn’t deter me from enjoying it since I was not expecting this dish to taste exactly like the original version. The beet salad were julienned strips of raw beets, perhaps lightly boiled due its slightly firmness, mixed with a well-balanced mix of vinegar and sugar, making it tasty beyond its mineral goodness. 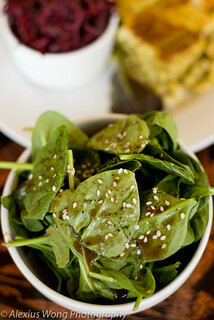 The spinach salad was a bowlful of young leaves tossed with balsamic vinaigrette and topped with some sesame seeds. I enjoyed the salad for the young tender crisp leaves but I wished the seeds were toasted to bring out more of their nuttiness to add another dimension to the combination. Again, the main and sides shone on this occasion, making them quite worthy of an order. Some sides from my friends’ orders deserve some mention: N’Orleans Macaroni Salad wowed its diner with its creamy flavors and the use of spices and seasonings evoking the Southern city, and a stark Steamed Broccoli that was steamed to perfection with its bright green crunchiness made savory with the use of Amino Liquid for that vegan umami-ness. On one occasion, our young waiter highly recommended Vegan Carrot Cake and we took on his advice. 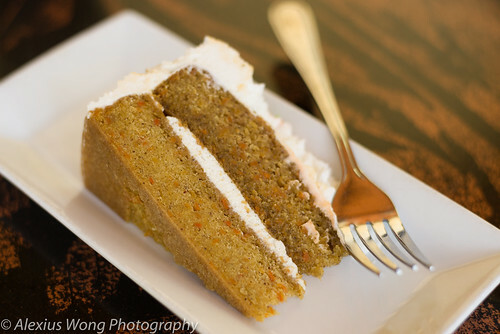 The slice arrived with speckles of carrot imbedded in the cake topped with some “icing”. The bite tasted of vanilla, cinnamon, and cloves, all the appropriate spices and flavors of the real thing. However it was lacking some rich bits of nuts and it was too dense for my liking. Not totally disappointing, but not really a flying success either. However, the amiable chef owner assured me that he would relay my suggestions to the pastry chef. 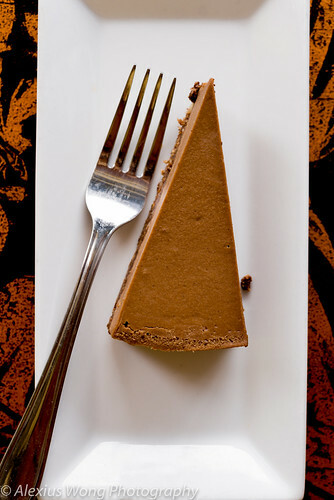 A waitress’ recommendation on another visit was Raw Chocolate Cheesecake. One bite into it raised my eyebrows as well as those of my fellow diner. My immediate reaction was “creamy dark chocolate ice cream.” There was a lusciousness in each bite that belied its dairy-free nature, slightly bitter from a boost of cocoa with a tinge of sourness to cut through the richness. The crust mixture of crushed cashew nut and coconut flake fooled me that it was raw and vegan. With each bite, my friend and I were “oohing” and “aahing” and we couldn’t stop until the last morsel, even though we were quite sated from the mains and side dishes. This dessert is a must order in my books. Vegan food is usually associated with plain, bland, textureless, and perhaps pedestrian, all adjectives enough to kill the enthusiasm even before stepping into such establishment. But what my friends and I ordered here far exceeded that mindset, from the “chick-un” and soy fish that had the right textures, seasoning, and flavors that not only made them palatable but sated all my dining friends, to the Mac and Cheese that was creamy and quite “cheesy”, and to the incredible sides of leaf salads, beet salad, yams, and squash stew (ratatouille) that left us wanting more of these tongue-grabbing veggies. This effusiveness extends to the dessert section with that raw chocolate “cheesecake” that just brought out a level ecstasy in me. Sure that the service is a tad slow and sparse at times, but the congenial servers make up for it with their charming personality, helpful suggestions, and funky hair. 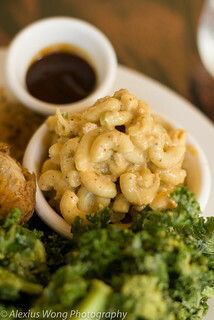 But what is served by Evolve Vegan does not need any quotation marks or qualifiers; it is just good, tasty and downright soulful, enough to bring out a smile in both vegan and non-vegan.